Having a little grubby bub at home usually means I can't focus on one thing at a time, having to always have an ear attuned to her various noises. So I end up forgetting where I was before I was interrupted by her most recent "episode". As a segue from all things bub-related, I'm getting inspiration from children's TV shows at the moment. She's mesmerised by Boohbah, Pocoyo and Pinky Dinky Doo, and I can see why! The colours and shapes are so bright and vibrant, they're just wanting attention. So back to inspiration - I thought I'd start with circles. Years back when I took up a studio art class to get back into the groove of oil painting, the term's theme was circles. I took it one step further and composed a picture from "circles in nature", choosing whirlpools. This had immense potential in that I could play with colour in the ripples. 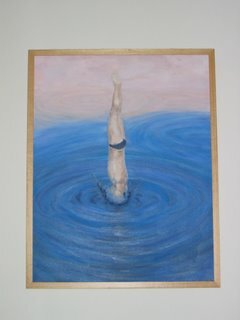 I just added the diver as the main subject of the art work to provide context to the water. Must find an image!!! Wish me luck! Very nice painting. I like the whirlpool concept. I enjoy watching the ripples of rain on water. Very soothing.